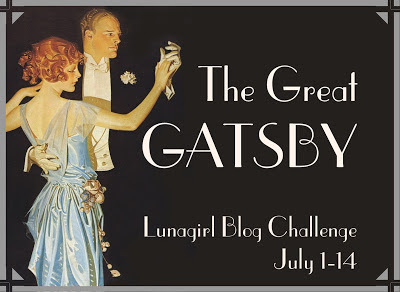 Here's the next Lunagirl Moonbeams Blog Challenge theme: The Great Gatsby! 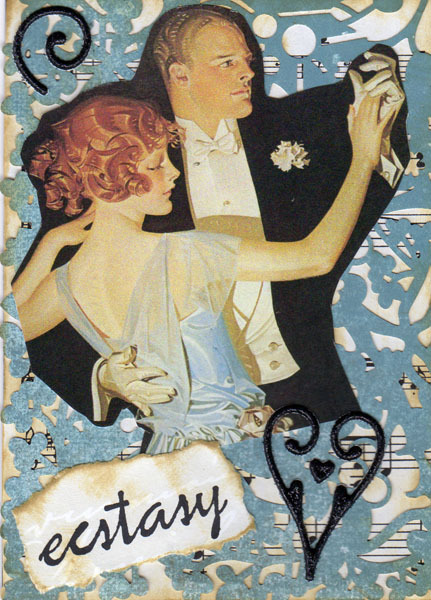 Whether you've read the book and seen the movies, or not, the title brings to mind the fabulousness of the Roaring Twenties: sassy and sultry flappers, dashingly handsome men, speakeasys and bathtub gin, big dance parties with jazz music, and of course plenty of drama, plenty of romance, and plenty of bling! The Design Team is starting the theme off right with their gorgeous cards below. 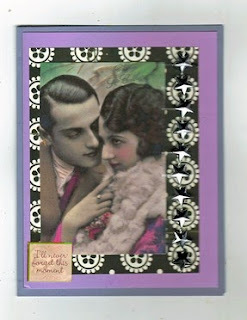 This time they are using images selected from two Lunagirl image CDs: Vintage Lovers and Vintage Women & Men. Reflecting that, this time instead of giving away a free collage sheet I'll make the prize a $5 coupon code to use on anything at Lunagirl.com, image CDs or collage sheets or download packs. This challenge (#5) will end at 11:55 pm on July 14 ~ The winner will be selected randomly (random number generator) to win the $5 discount coupon for Lunagirl.com. If I get 20 entries for this challenge, I'll draw TWO winners! Of course I love if you use at least one Lunagirl product, but that's not a requirement! First, here are two cards by Vicki Romaine. They are very different in color and elements, but both perfectly evoke the Roaring Twenties! "I placed the image a little off center as I have a row of silver stars going down the right side to balance. I thought the stars were the perfect embellishment to portray The Great Gatsby movie." "When I think of the '20s, I think "classy". 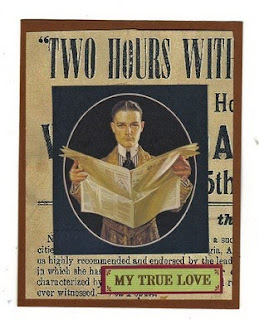 Therefore, I tried to make a classy masculine card--very simple, but dramatic. The images from the CD are even better than the ones on the collage sheets. The background on this card is the one I bought from you a couple of weeks ago. Hope you like this." "The Great Gatsby ... what a movie! I just love the fashion, the wonderful settings and such handsome man (lol) ... isn't the lady just so lucky? This image comes from Lunagirl Vintage Lovers CD. The colours are gorgeous and worked perfectly with some papers I had hidden away for the perfect occasion. I embellished the card with some bling, organza roses, a little frame and a feather." 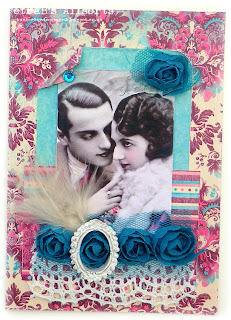 Last but not least, here is a beautiful card by Michele Storms. If you look closely, you'll see the sheet music in the background -- perfect for dancers in ecstasy of course, and for a time when music was so important to the young and fabulous. Thank you, ladies, as always for your inspiration! You always come up with cards and other creations that showcase the theme so nicely, each in your own unique style. Readers, show us your vision of 1920s romance and bling ~ enter the Great Gatsby blog challenge! Wonderful images and great fun to use. The images are gorgeous and so brillaint to work with. Ladies, your pieces are brilliant. I've been waiting for this challenge to come up. Can't wait for the Alice one! Here is my entry. Thanks for the great inspiration from the DT! Great design team samples. Love the images they used for their cards. Thanks for the "great gatsby" challenge!